The most complete website worldwide dedicated to the relatively few Schwimmwagen still fit for the road, run by Bart Lemmens. Information about a Swiss Schwimmwagen, with pictures movies and much more. The History on Wheels Museum is a privately funded, non profit making, family museum. Situated in the South East of England, in Eton Wick, close to Eton College and within sight of Windsor Castle, History On Wheels is more than just a motor museum. 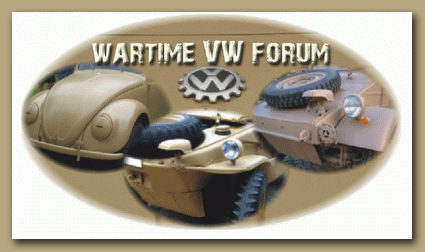 Information and photos about Kübelwagen's and Schwimmwagen's plus the classifieds section carries a nice range of high quality parts - Highly recommended. Highly recommended dealer for all types of parts and accessories for your Schwimmwagen or Kubelwagen. A site is dedicated to 1/6th scale models, figures and dioramas built by the Kampfgruppe von Abt Modelling Team. For fully operational remote control "All Metal" sixth scale models, there is only one choice - Armortek. Anything else really is just a toy! It is the aim of Carbody-Restoration to rebuild a perfect vintage car, from either the craftmanship and the historical point of view. Carbody master company: the master craftman works himself. Good work for a fair price - contact us! Hiring and organization of military vehicles for historical documentaries and war movies, reconstruction and construction of historical military vehicles. Trained drivers, technical service on the set. Historical military advice – boot camp: personal individual training on all weapons, including action films. Training of actors and extras, advice on uniforms and equipment.